First sentence: The chubby little human was doing his damndest to hump my leg, but the palm I'd placed on his forehead kept him at arm's length. Lyla, a jinni, works as a belly dancer at Purgatory. She is unbound, and able to control a bit of power but nothing compared to when she is bound. Enter Oz, a magi that manages to find Lyla and bind her to do his bidding. His goal is to find a friend from his past that went missing after her family was killed. Lyla and Oz's journey together is packed with misadventures and things that go bump in the night. From bugbears to crazy vampire kids out to get them, they have a lot to handle when trying to find his friend. 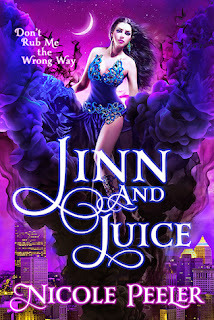 The characters in Jinn and Juice are quite diverse, there is a bit of everything you could want. Trolls, sirens, and will o' the wisp, oh my! The big bad villain, Kouros, was introduced fairly early in the book by telling Lyla's past. Kouros cursed/tricked a young human Lyla into becoming a jinni. Those trickster jinnis manage to wiggle around orders easily. This was a pretty enjoyable read, the plot is sound, the world is set well, and the characters are engaging. I'd recommend this book if you're looking for a jinni Urban Fantasy. omg that is quite the opening line! ::snort:: I have got to start her books. I know, right? I was like I have to include it in the review, I have to! LOL, I really like that first sentence! I've seen this book around and it's getting me really curious... I should add it to the list, shouldn't I? I was curious about this one. I like the sounds of the world and magic. I'm a little worried about that first sentence and her job in hell now though. Ha! Great opening sentence. Love Nicole Peeler and can't wait to read this. Glad you enjoyed it!